The National Construction Code (NCC) incorporates all on-site building and plumbing requirements into a single code, setting out the minimum requirements for the design, construction and performance of buildings throughout Australia. In Queensland we also refer to the Queensland Development Code, which contains, amongst other things, Queensland variations to the National Construction Code. The Building Code of Australia (BCA) and Plumbing Code of Australia (PCA) are given legal status in Queensland by reference in the Building Act 1975 and the Plumbing and Drainage Regulation. If you’re not working with the right version of the NCC, you’re in breach of their statutory and contractual obligations, so make sure you’re across the below 2019 changes, 2018 amendments (including slip-resistance requirements for houses and requirements for eaves gutters), as well as the 2016 changes. The layout to the NCC has changed to improve accessibility by introducing a consistent format and includes new verification methods and acceptable construction practices. There is a significant change to the NCC as a performance-based code. An estimated 40% of the Performance Requirements can now be quantified by a Deemed to Satisfy (DTS) method or by using a Verification Method (VM). The remaining performance requirements of the codes will be quantified by a DTS or VM for NCC 2022. The energy efficiency provisions of part 3.12 have changed. A transition period of 12 months applies until 1 May 2020 during which time the new NCC 2019 or NCC 2016 may be used. The heating and cooling load limits are specified in the ABCB Standard for NatHERS Heating and Cooling Load Limits which can be accessed on the Australian Building Codes Board website. New part 3.1.2 applies for retaining walls associated with the construction of a building or structure where the embankment is steeper than stated within the NCC. Australian standard AS 4678: 2002 Earth Retaining Structures is the new acceptable construction manual that may be used to design a retaining wall with a typical design life of 60 years if required. Retaining walls can also be designed using the other structural design manuals referenced within the code. Technical requirements of the masonry standards AS 3700 and AS 4773 have been referenced and provide detailing for masonry units, mixes, joints, cavities and damp proof courses. Detailing is also provided for sub-floor piers and masonry piers that support carports, verandahs, porches and similar roofed structures. A new part 3.5.4.6 includes new requirements for wall flashings. Flashing must be suitable for the framing, cladding, window reveal, door system or any architrave or finishing trims that are installed. 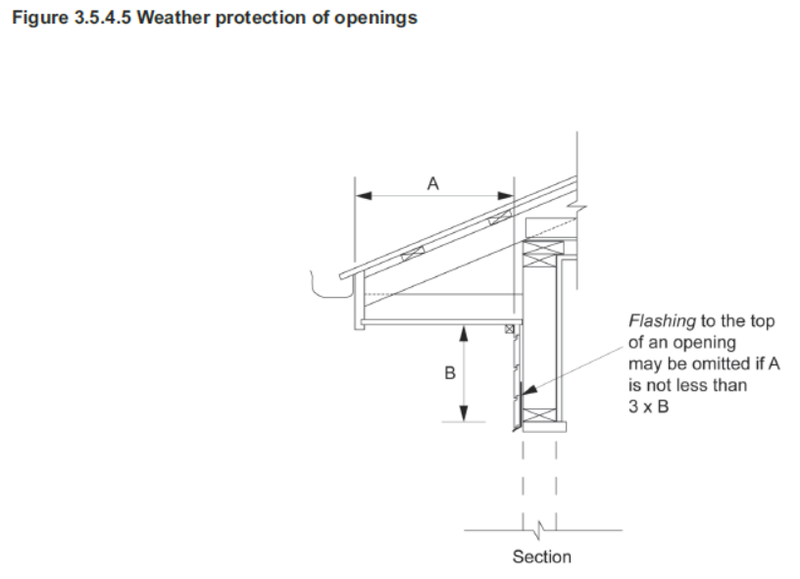 The top of an opening need not be flashed where it is adequately protected by an eave of a width more than 3 times the height of the cladding above the opening (See Figure 3.5.4.5). Flashings must be securely fixed at least 25 mm under the cladding and extend over the ends and edges of the framing of the opening. New part 3.10.6 includes acceptable construction practices and attachment methods for decks and balconies to the external walls of a building. They can only be used where the floor surface of the deck or balcony is not more than three metres above the supporting footing. Where a deck or balcony is constructed outside the conditions listed, the method of attachment to the building must be designed by a professional engineer. A new part 3.8.7 includes provisions for the installation of water control membranes (sarking), ventilation of roof spaces and the discharge of exhaust systems. Exhaust from a bathroom, sanitary compartment or laundry must discharge directly or via a duct to the outdoor air, or a roof space with evenly distributed openings having a total unobstructed area of 1/300 of the respective ceiling area if the roof pitch is more than 22°, or 1/150 of the respective ceiling area if the roof pitch is not more than 22°. 30% of the total unobstructed area must be located not more than 900 mm below the ridge or highest point of the roof space, measured vertically. Part 3.12.3.3 has been amended to include that a door between a Class 1 building and an unconditioned Class 10a part of a building must be sealed to restrict air filtration at the bottom edge with a draft protection device, and at the other door edges with a foam or rubber compressible strip. The sealing requirements of ceilings, walls, floors and any opening must be enclosed by internal lining systems that are close fitting or sealed at junctions and penetrations with close-fitting architrave, skirting or cornice; or expanding foam, rubber compressive strip or caulking. Schedule 7 is a new non-mandatory Fire Safety VM based on the International Fire Engineering Guidelines with a delayed adoption date from 1 May 2020. Specific design scenarios must be considered to demonstrate that the fire safety aspects of a building design comply. Table E1.5 includes a new requirement for fire sprinklers to be installed in Class 2 and 3 buildings and Class 4 parts of a building with a rise in storeys of 4 or more and an effective height not more than 25 m.
Two new types of fire sprinkler systems have been included, as well as concessions for other fire safety features. The ability to use a bonded laminated material, with specified characteristics and controlled fire hazard properties, where a non-combustible material would otherwise be required will remain for NCC 2019. A similar concession has been included for certain sarking-type materials, and some other minor components have been exempted from the requirement to be non-combustible. Section J of the 2019 edition of the NCC has been significantly re-written and the commercial building energy efficiency provisions have undergone their first major overhaul. New VMs have been introduced to demonstrate compliance with the relevant Performance Requirement by way of NABERS and Green Star. A transition period of 12 months applies until 1 May 2020 during which time the new NCC 2019 or NCC 2016 may be used. A new part G6 is included for buildings containing an occupiable outdoor area to ensure that materials and assemblies restrict the spread of fire and heat to maintain tenability to permit egress. The fire hazard properties relating to flammability and flame propagation will apply to these areas. This is in recognition that occupants of an occupiable outdoor area are constrained by the building, and therefore require a means of evacuation in an emergency. The provisions are not applied to private residential balconies (class 2 or 3) or smaller balconies (less than 10m2) found in commercial buildings. New part F2.9 includes requirements for accessible adult change facilities in certain new or redeveloped public buildings such as shopping centres, museums, theatres, sporting venues and airports. The sanitary facilities have additional features to assist people with more profound or complex disabilities who are unable to independently use standard accessible facilities. A new part FP6.1 contains performance requirements for the management of risks associated with water vapour and condensation. New DTS provisions have been included for water vapour and condensation management, including the installation of water control membranes, the discharge of exhaust systems and the ventilation of roof spaces. A new VM FV6 is provided as an option by using modelling to assess the effects of various factors to be considered when managing condensation to meet the performance requirements. NCC compliance is a statutory requirement, and you should always review and check that your work complies with the applicable sections of the code.